Hey, guys, I know you’ve wondered sometime who would win in a fight between two famous monsters. Or between two superheroes. Or between two killer animals. All boys think about this sometimes. Boys have always wondered about this. That’s why we had the movie King Kong vs Godzilla back in my day. That’s why we hadBatman vs Superman this year. 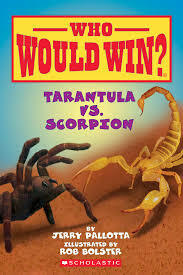 And that’s why we have the Who Would Winseries of books by Jerry Pallotta (illustrated by Rob Bolster). These books are very cool! They’re informational and interesting, plus they end with a fight between two killer animals. What could be better? 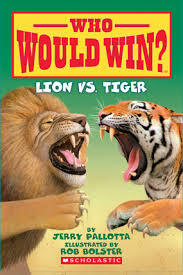 And, if you don’t agree with the outcome of the fight, there’s a page at the end of each book that lists the advantages of each animal and let’s YOU decide who would win! All of these are quick and fun (what I call Good Quick Reads) and would be really good for our younger reader guys, like maybe second–fourth graders, But older guys would enjoy them too. And, teachers, these would be the ideal books if you have boys think they don’t like reading. I just can’t help being excited right now. In fact, the whole city of Charlotte feels the same way because we’re not only going to the historic Super Bowl 50 but we’re going with the best team we’ve ever had and the most incredible quarterback this town has ever seen. No wonder we’re all a bit hyper, giddy and barely able to contain ourselves. But I really did find a truly cool book and it’s Legends: The Best Players, Games and Teams in Football by Howard Bryant. I’ve enjoyed it a lot. Mr. Bryant, a sports writer, tells the story of how the Super Bowl got started and the many great and even iconic games throughout its history. There are exciting stories, many interesting facts and tales of heartbreak and triumph. Greetings of the New Year, guys! Hope that 2016 turns out to good and prosperous for all of you. I started the year right by going to see the new Star Wars movie. Wow! Was it great?You bet it was! I won’t talk about the movie right now because I could go on all day but I will tell about a really cool Star Wars book. 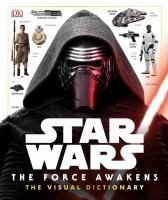 It’s Star Wars The Force Awakens: The Visual Dictionary and, man, is it ever great! Lots of very cool photos of the characters, equipment, droids, weapons, starships, etc. with information about each of them. Want to know what happened between The Return of the Jedi and this movie? It’s in here! Want to know about the starship graveyard on Jakku? Kylo Ren’s lightsaber? Rey’s speeder? Want to learn more about TIE and Resistance pilots? It’s all here–and a whole lot more! Read the rest of my review at the Boys Rule! Boys Read! blog. Let me tell you about one of my favorite obsessions. It started way back in 1994. A friend gave me a copy of The Battle Cry of Freedom, a one-volume history of the Civil War. (it’s very good but also long and written for grownups) Like most guys, I had taken American History in school and thought I knew all about the conflict between the states. But, while reading that book, I was amazed at how much I didn’t know. And I was much further amazed at all the stories I didn’t know about. Tales of courage, heroism, and incredible endurance.Stories like soldiers marching through icy rivers with icicles forming on them. Or the First Minnesota at Gettysburg, the 262 Union soldiers who charged into 1200 Confederates to keep the Confederates from breaking through a hole in the lines. Or the story of The Angel of Marye’s Heights at the battle of Fredericksburg, the Confederate soldier who took water to wounded Union soldiers, even when he was being shot at. The more I read, the more stories I found and became hooked on reading about Civil War history. I’ve recently read some terrific books about the CW and liked them so much that I wanted to tell you about them–not to mention it’s in keeping with my 2014 resolution to share more nonfiction with all you boys. Want to know which books I read? You have to read the post at Boys Rule Boys Read! Yep, I had Duke going to the final game (against Virginia) and NC State going a couple of rounds. Good thing my guys from Carolina won last night. It’s pretty obvious I’m an ACC fan, right? Anyway, in honor of March Madness, I’m going to do a Blast From the Past and repost something I’ve written before. This time it’s a review of two good nonfiction books about playing the roundball game that I wrote back in June 2013. OK, guys, get these books, practice your free throws and cheer for your team! Iron Guy Carl at Boys Rule Boys Read! This is the time of year when bloggers post their Favorites of 2013 lists or Best Books for the Holidays lists but the Iron Guy, never afraid to do things differently, is going to do something, well, different. I’m going to recommend a couple of biographies. These would make great reading over the break. As well as doing some fun reading like Unstoppable: No Where to Run, it’s good sometimes to read about real-life people and learn from the great lives they led. Two of the best biographies I’ve read in a long time are To Dare Mighty Things: The Life of Theodore Roosevelt by Doreen Rappaport and Lincoln: A Photobiography by the great Russell Freedman. The first one is brand new; in fact, I got it just a couple of days ago. It’s a terrific story of a remarkable man. Theodore Roosevelt was, in some ways, one of the toughest guys ever in the White House. He herded cattle for three years in the Dakotas, led the Rough Riders in the charge up San Juan Hill in the Spanish-American War and galloped around Washington DC every morning on horseback. but he didn’t start out that way. Teddy was a sickly child–he “coughed, sneezed, wheezed, had raging fevers, and hardly ate. His asthma was so bad that he had to sleep sitting up in bed or in a big chair.” But he didn’t let that stop him. He lifted weights, climbed mountains and exercised enough to build his body into health. He also read “books about the soldiers at Valley Forge and frontiersmen Davy Crockett and Daniel Boone” saying, “I felt a great admiration for men who were fearless. I had a great desire to be like them.” As a politician and president, he fearlessly took on corrupt police departments, city governments and business monopolies. Not only that, he explored the western wilderness, fell in love with and preserved much of the great outdoor USA as National Parks. TR lived an epic life and this is an epic book. The story is interesting and the illustrations are great. And it’s a Good Quick Read. I finished it in about a half hour, but it has stayed with me. What a guy! What a story! What a book! And it’s a fun read too–just wait until you read about the giant tortoise escapin in his college dorm room! The other book is older (it came out in 1987) but it’s still good. In fact, it’s one of the most remarkable books I’ve read this year. Lincoln: A Photobiography is another epic story about an epic life. Abraham Lincoln was the essential American success story; the poor uneducated boy who became President. He was born in the middle of nowhere to parents “who couldn’t read or write at all.” but decided to educate himself out of poverty. He borrowed books whenever he could and read all the time. He would even “carry a book out to the field with him, so he could read at the end of each plow furrow while the horse was getting its breath.” Eventually he learned law and went into politics. Not only was he physically tough (“his hard physical had given him a tough, lean boy with muscular arms like steel cables”) but he was morally and mentally tough, taking on things that would have crushed many other men. He kept the country going during the Civil War when most everyone wanted to give up, fought tirelessly to end slavery, endured criticism for years (being called once “the original gorilla”) and all this time having to fight against sever depression. But, in the end, he triumphed. He won the war, ended slavery and became the most respected man of his time. Until his tragic end. I need to say it again–What a guy! What a story! And what a book!! Russell Friedman is a powerful writer and really brings this tremendous story to life. I’ve read a lot about Abraham Lincoln but still found myself turning page after page to keep reading this incredible story. And it won the Newbery award for best kids’ book of the year in 1988. Rightly so. And do you what these two great men had in common? Other facing up to great challenges? Other than leaving their worlds better places? Other than bringing themselves up out of bad childhood situations? That’s right, guys. One of the ways they brought themselves out bad circumstances was reading books. Roosevelt inspired himself with books about soldiers and frontiersmen. Lincoln read books and educated himself into a better life. READING CHANGES LIVES. Remember that. That’s why I run this blog. Get books into your hands, boys, and who knows what you could accomplish. Well, thanks for letting onto my soapbox. If you want to read about how reading changes lives, click on the “Being Teddy Roosevelt” tab under this post under this post and see my review of that terrific book. If you’d like to read about another book by Russell Freedman (about Valley Forge! ), click on the “Russell Freedman” tab. Same thing if you want to learn about more biographies. I hope all of you have a great holiday season. And be sure to write in to us at Boys Rule Boys Read!